what are “the magnificent seven” feasts, and what do they mean? 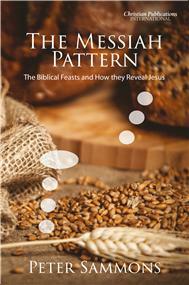 how do the biblical fests speak directly of Jesus? Peter Sammons – author of “The Birth of Christ”, “The Prince of Peace”, “One Flesh” and several other Christian books, is a writer with a gift for reducing sometimes complicated theological themes to concepts to which we can all relate. This book is substantially the same as “Israel's Holy Moedim” (published by Glory to Glory Publications) which has been prepared for overseas markets. The book is also available via Amazon "createspace". CUSTOMER AWARENESS: Some of our books are available through Amazon. When buying through Amazon, note that various services are periodically offered on a subscription basis in addition to the purchase actually being made. Sometimes Amazon expect customers to “un-check” a check box so as to opt-out (rather than opt-in) to the purchase. Our advice is to be alert for opt-outs, which may not be prominently displayed. And of course if you are required to “un-check” a box, then DO un-check it!